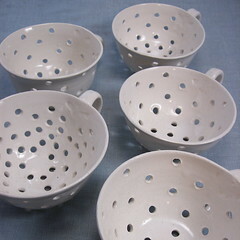 Here are five of the bowls- out of 30 I lost 6 to stress cracks (lines going from hole to hole or from the rim) or just plain old dropping them on the floor. You can tell from this photo that my piercing started out willy-nilly and got more evenly spaced as I made more of them. I've listed all of the orders over on etsy. The rest are going to the farmers market with me on Saturday, then I'll have more between June 1 and 14. Even though I'm calling these berry bowls, which is how I was introduced to them with the gift of my first berry bowl, I could see these as great little harvest bowls for picking green beans, cherry tomatoes, pulling carrots or radishes. . . and then blueberry season will soon be upon us!